Would you like to go and explore dinners and meals at people’s private homes? EatWith organizes verified cooks, from professional to amateur that prepare shared meals (with other paying guests) hosted on private homes / locations. 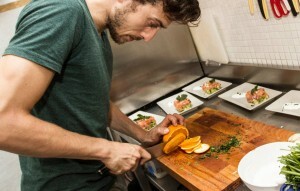 “EatWith hosts share a talent for making amazing meals and a love for welcoming people into their homes to share them. Join us around the table to experience the most creative, gourmet and handmade meals your city has to offer. EatWith hosts range from professionally-trained, Michelin-starred chefs to the most passionate and practiced home cooks. Every host is interviewed by the EatWith team and currently only 4% of all applicants are accepted. Chefs set the menu based on what inspires them and use the freshest ingredients to prepare a personalised dining experience. Try an authentic ethnic meal or custom-designed tasting menu-dishes you won’t find anywhere else in town.